Wedding Packages Tailored to You. Let us provide you with the perfect setting for your wedding. Our wonderful wedding packages can take the stress out of planning your big day, allowing you to focus your attention on the smaller details. Because we have been involved in the wedding venue industry for so many years, we can now offer you a range of bespoke packages, catered entirely around you and your requirements. Speak to us today and discuss your ideas. We are totally flexible and devoted to making sure your day is exactly how you want it. If you want to have a bespoke package then please ask we will happily switch elements around and are happy to take on board any other ideas you might have such as balloons, photographers, transport and much more. The packages below are for late afternoon and evening receptions, if you wish to arrive before 4pm and have a delicious carvery or full bespoke Wedding Breakfast give us a call on 01246 204 884 or check out our menu ideas under the food tab inspiration. Prices for both evening and daytime are shown by clicking Package buttons below. If you are looking for the perfect wedding venue in Chesterfield, whether you are looking for an intimate reception or a wedding for hundreds we have the facilities to make your dream day come true. 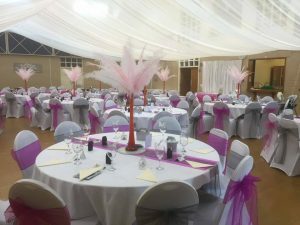 We are proud of our large Scarsdale Hall which is 17 metres by 15 which can seat up to 150 guests and accommodate many more for a an evening disco. The Scarsdale Hall has an option for a stage so if you have a desire for a live band then let us know. You will not find better value for money than us and we are by far the best price option for miles around. We have several other different sized rooms which can be decorated for a sit down meal and also the option of having a marquee within our grounds. Whether for your wedding day, birthday party or any other social event, we can meet your needs. Here at The Arkwright Centre, we have been doing weddings for years. Because we have been working with couples and families for all these years, our level of experience is second to none, meaning that there truly is no place better for the wedding venue of your dreams. We focus on what we believe is most important; offering you the quality standard of service that you need, combined with an excellent eye for detail and a patient and open attitude to your ideas. We know that if you aren’t 100% happy, nothing else matters – so we strive to impress you, both in service and in our prices. We are the perfect wedding venue in Chesterfield.